Stockholm was our first contact with the Nordic countries of Europe, and although it was quite a short trip, we enjoyed every piece of this city, even if for some days the weather was not exactly what we wished for. We left home thinking that we would love this trip and the city, and in the end, it turned out that it was true. We weren’t away for a long time and we were in very much need of a getaway from home. With the baby now, it’s a bit difficult to find some time for ourselves, but planning this trip was a really great decision. We managed to enjoy every bit of it and come back home relaxed and full of joy and happiness. Stockhom greeted us, in our first day there, with a rainy weather (not something we wouldn’t have expected, to be honest), but still we had some activities planned even on this weather. 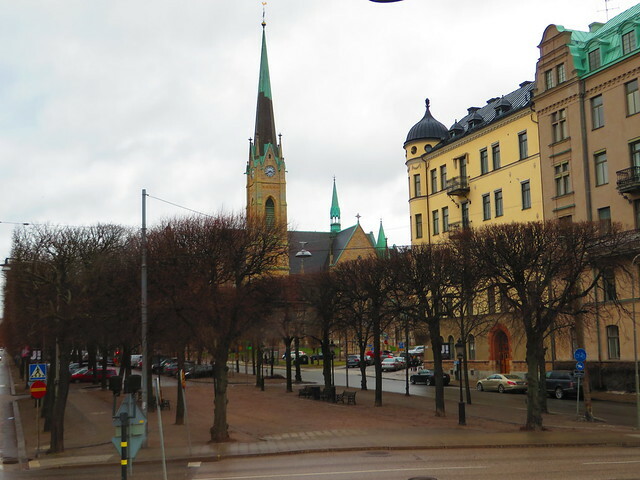 We landed at 10.00 AM in the Stockholm Airport and we headed directly to our hostel to leave our luggage and start exploring the city. For the first night of our trip, we stayed in the Anedin Hostel, which is a big boat on the anchored on the shore. We booked in advance the Stockholm Pass for 5 days, which was a great decision. It gives you access to almost all of the Stockholm attractions, you have the hop on – hop off bus included, you have all sorts of boat trips included and you have all public transportation included (all the transport from and to the airport). For 5 days we paid about 125 EUR for the pass, but considering all the visiting we did and all the public transportation we used, it was way cheaper than if we would have paid for each item individually. To get from the airport to the City Center you have to take the bus 583 to Marska Station and the hop on a train to the Stocklhom Central station. From there you can take the subway or buses/ trams to go wherever you need to. After having this quick lunch, we left our luggage to the hostel and, as it was rainy, we decided to go inside the Fotografiska Museum, which was right next to our hostel (and which was included in our Stockhom Pass). Fotografiska is an international meeting place where everything revolves around photography. Located in the heart of Stockholm, the museum has an exhibition space of 2,500 square meters, and features 4 major exhibitions per year and approximately 15-20 minor exhibitions. The museum exhibits world-renowned photographers, many who have never been shown in Sweden, as well as those who are not yet established. Since the grand opening, May 20th 2010, they have shown legends like Annie Leibovitz, David LaChapelle and Nick Brandt and introduced new photographers like Helena Blomqvist, Klara Kallstrom and Johan Wik. Fotografiska is housed in a former industrial Art Nouveau style building dating back to 1906. Designed by Ferdinand Boberg, the building was used for the customs control of goods and is listed as a building of cultural interest. The original brick facade of the beautiful customs building is intact, while the interior has been renovated to house the museum. After the visit at the museum, we decided to take the hop on – hop off bus (as it was still raining) and see all the attractions and where they are located so that we knew in the next days where to go. It’s one of the easiest way to see all the attractions in one go, or make your own itinerary and hop on and off at your favorite attractions with over 24 stops. The bus stops at all the famous sites in Stockholm, like Gröna Lund, the City Hall, Skansen, Fjällgatan, Abba The Museum, Ice Bar, the Royal Palace, Old Town and several popular shopping districts, plus it has an audio guide, which is quite helpful to give you an idea of what Stockholm is all about. One full tour lasts about one hour and 30 minutes. After all the sightseeing, we meet in the afternoon, a friend who was born and lives in Stockholm and who we had the chance to question about all sorts of things related to Sweden and Stockholm, in particular. Like I had imagined, people don’t really like the weather there, but in the last years it happens quite often that summer is more sunny and warm, which makes them happy and in the mood for going out and enjoying themselves. People can be very friendly and helpful, but they respect their private space and personal time quite a lot. The Swedish social system is very well built and it has a lot of advantages for its people, but for this, each of them has to pay very high taxes. This is why it’s quite an expensive country and Stockholm is the most expensive city we’ve ever been to so far. Alcohol and tabacco are considered luxury items, so they are very high taxed and, therefore, very expensive. Moreover, in supermarkets you only get alcohol of maxim 3%, for more you have to find the System Bolaget stores which sell only alcohool and which are open until 8 PM during weekdays and 2 PM on Saturday (Sunday it’s closed). We did check those places quite a lot during our trip, they do have quite a big variety of beers and wine, so we had a lot to chose from. For dinner we went with our friend to a Turkish place, Amida Kolgrill, which had good prices and delicious dishes. We returned to this place for our last dinner in Stockholm. First day ended with a nice walk and the view of the sun setting down over the beautiful buildings of Stockholm!